For the first time in my reading life, I finished a book, turned back to page one and started reading it again. The story and characters so compelling, the story telling so complex, complete, and often subtle—I simply couldn’t just move on to another book. But the more urgent need for the immediate reread came from the emotions evoked. Tragedies happen all the time. People are killed—floods, fires, airplane crashes, auto accidents, tsunamis…. Focusing on a few of the individuals connected to a Tube accident in London blamed on the dead, Davis shows the harshness of the impact on the families of the dead and the burden of sorrow they carry that lasts forever. Davis shakes us out of our complacency and rightly so. Tapping into the issues of the day, Davis delivers a highly charged work of fiction, a compelling testament to the human condition and the healing power of art. Written with immediacy, style and an overwhelming sense of empathy, Smash all the Windows will be enjoyed by readers of How to Paint a Dead Man by Sarah Hall and How to be Both by Ali Smith. 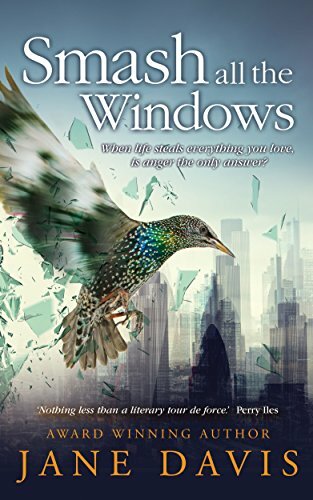 If you do read Smash all the Windows, I’d love to hear what you think of it. Six-Word Story Challenge – “Blog” & A Question.